Camshaft alignment tool – BMW No.11 8 760. Crankshaft holding tool – BMW No.11 4 320. Crankshaft pulley turning tool – BMW No.11 6 480. Flywheel/drive plate timing pin – BMW No.11 5 320. High-pressure fuel pump sprocket removal tool – BMW No.11 8 740. Tensioner locking pin – BMW No.11 3 340. NOTE: Timing chains located at rear of engine. Ensure camshaft lobes positioned as shown  . Install camshaft alignment tool  . Ensure camshaft alignment tool abuts cylinder head. Remove secondary timing chain tensioner  . Slacken camshaft sprocket bolts  . Remove secondary timing chain tensioner rail and chain. Install crankshaft holding tool  . Secure tool with bolt  . Slacken high-pressure fuel pump sprocket bolt  . Remove high-pressure fuel pump sprocket. Use high-pressure fuel pump sprocket removal tool. Compress primary timing chain tensioner and lock with pin  . Remove primary timing chain tensioner  . Remove primary timing chain guide and tensioner rail. Remove crankshaft holding tool  . Remove high-pressure fuel pump sprocket complete with primary timing chain. Fit primary timing chain to crankshaft sprocket. Crankshaft position set at 45° ATDC No.1 cylinder. Ensure groove on high-pressure fuel pump shaft aligned with lug on timing case  . Install high-pressure fuel pump sprocket. Ensure timing mark on high-pressure fuel pump sprocket aligned with lug on timing case  . Tighten high-pressure fuel pump sprocket bolt  . Tightening torque: 65 Nm. Install primary timing chain guide and tensioner rail. 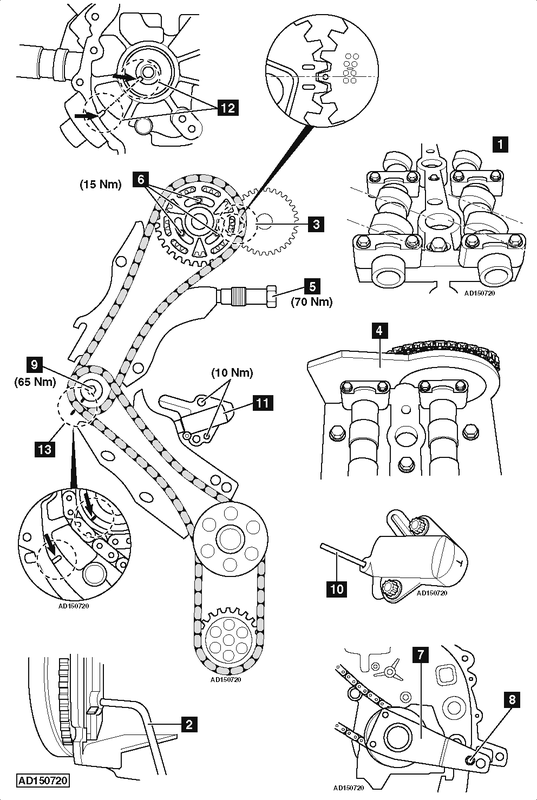 Install primary timing chain tensioner  . Install secondary timing chain tensioner rail. Fit timing chain cover and flywheel. Temporarily tighten camshaft sprocket bolts  . Tightening torque: 10 Nm. Slacken camshaft sprocket bolts 90°  . Install secondary timing chain tensioner  . Tightening torque: 70 Nm. Tighten camshaft sprocket bolts  . Tightening torque: 15 Nm. Ensure timing marks on camshaft gears aligned  . Ensure camshaft alignment tool abuts cylinder head  . This is so clear, hope it will help many more. Very good manual. One question: Why do the cylinder head need to be removed?